The local singer openly sought the help of good friend Ella Chen to put in some 'good words' for him. 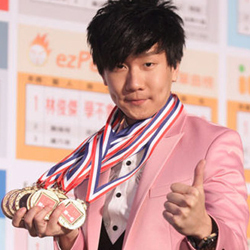 When local singer JJ Lin released his latest album Lost N found, it was vaguely revealed that his record label forbade the singer from pursuing matters of the heart. However, at the party celebrating his album's good sales performance, JJ openly expressed, "I hope I can be No. 1 in whatever I do, and I hope someone can introduce me a No. 1 girlfriend too." The singer specially mentioned S.H.E. member Hebe Tien, saying that he wanted to invite her as a guest singer for his upcoming concert. He added, "She is my type, but I may not be the type of guy she likes." Looking slightly embarrassed, JJ revealed that his record label tried to invite Hebe once. However, the pair missed out on the chance to work together, due to scheduling conflicts. JJ also expressed his hopes to do a duet with her in the future and added, "I really admire her, but I'm worried that I won't be able to sing when I see her." Commenting on Hebe's recent declaration that she "wants to date", JJ laughingly requested for good friend Ella Chen to help him out. "Please put in some good words for me in front of Hebe," he said. JJ added that he is in contact with Selina and Ella, but does not have Hebe's phone number.